Getting my son to consistently eat anything is a challenge. He will love something all week then tell me "yucky" the next week when I give him the same thing. I have found I need to be creative in serving him the same items in a different way. Fruit is one of my favorite things, even my mom knows green grapes will cheer me up any day! My son is a bit more picky about the fruit he eats. He seems to like berries, pineapples and bananas. Thankfully they are all healthy for him. I have been finding new recipes online looking for ways to give my son the fruit servings he needs but in new fun ways. I found a great coupon for Dole Tropical Canned Fruit that had a recipe on the coupon insert. I often make meals or desserts from recipes I find in coupon inserts. Its easy to have the ingredients list and coupon all on one paper. 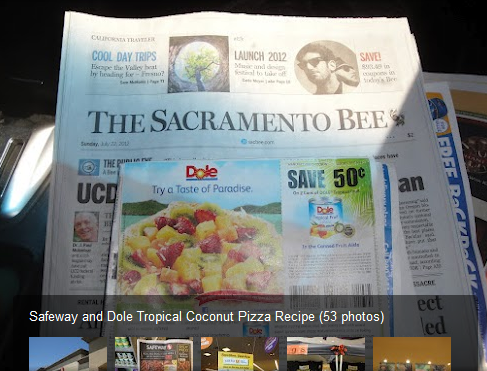 The Dole coupon had a recipe for Tropical Coconut Pizza. I was intrigued by the pizza part, my first thought was classic pizza, but then I read the recipe to realize it would be a creamy fluffy dessert pizza. We went shopping at Safeway for the ingredients for our dessert for later in the week. We made plans for a few friends to come over and play video games and I thought it would be the perfect time to share my Tropical Coconut Pizza. I like shopping at Safeway for the Just for U savings that I can combined with my paper coupons. I save a lot of money shopping at Safeway and they always have friendly checkers. We needed a few other items at the store along with the ingredients. I even grabbed a product new to me, Dole Aguas Frescas Watermelon. There was a $1 off coupon and on sale for $2. Awesome to get a juice with no HFCS in it for just a dollar! A few days later I made the Dole Tropical Pizza for my family and friends. I started the Pizza Crust part of the recipe in the morning so it could freeze for a few hours. baking sheet, building up sides slightly with back of spoon. Freeze 4 hours or until firm. desired. Arrange tropical fruit, strawberries and kiwi on crust. Serve immediately. Set out the Cream Cheese for about 30 minutes before you plan to make this recipe to make it easier to mix with the pineapple. The recipe from Dole calls for Cream Cheese with Pineapple. I could not find any in my local store so I purchased plain cream cheese and added 3/4 cup drained Dole crushed pineapple. I toasted my coconut in the oven on 250 degrees on a cookie sheet for 15 minutes. (make sure to check it often to not burn it.) I also set out the whipped topping from the freezer on the counter for the 15 minutes while I was toasting the coconut. The recipe says to put the mix out on a cookie sheet to place in the freezer. For my recipe I used two pie tins. To be able to create a nice tall crust for my pizza and my cookie sheet was too big for the space I had in my freezer. This little guy was keeping me busy while I waited for the tropical pizza crust to be ready. He makes a soft pile with pillows, blankets and stuffed animals everyday. Hes like a little animal! I placed them into the freezer to wait the 4 hours. While I was waiting I cleaned the house in preparation for a few friends coming over to play some video games with my husband and son. I loaded the dishwasher and washing machine, vacuumed the house, fed my son his favorite Tyson Dino chicken nuggets and veggie tots for lunch, checked emails then watched a Cat in the Hat cartoon with my son before we picked up all his toys in the living room. When the 4 hours had gone by I was so ready to try the Dole Tropical Fruit Coconut Pizza! I added extra coconut to the top of my crust. You can add it on top of your fruit as well. I wanted to have a bit of a crunch under the soft fruit. Just as he climbed onto the table to get me to continue letting him lick the pizza our friends arrived for dessert and video games. My son and I shared the one he licked lol and I sliced up and served the other one for everyone else. I love how this Dole Tropical Coconut Pizza turned out. Its sweet to eat and beautiful to look at. I can see us making this again using other fruit toppings too. Using the pie tin gave the pizza a nice tall crust. You can find more Recipes from Dole on their website. They have all sorts of recipes that I want to make. I have seen a few other bloggers make a turkey burger with Dole Pineapple rings that look delicious! You can read my Google+ story about my shopping trip to Safeway and see how silly my kid gets when we go shopping. *I am a member of the Collective Bias™ Social Fabric® Community. This shop has been compensated as part of a social shopper insights study for Collective Bias™ and Dole #CBias #SocialFabric #tropicalfruit All opinions expressed in this post are 100% my own. yummmo!!! this looks delish, ill have to try this with my kiddos as a dessert...thanks for sharing!!! Looks yummy! My son would be eating all the fruit too!